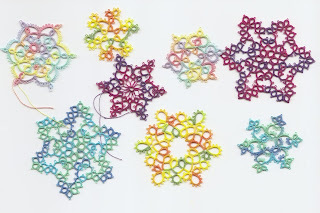 Here are some snowflakes that I made from Tatskool's beautiful threads, and mostly they are Jon's patterns. I kept making mistakes so often...and I wanted to cry, wasting such lovely thread, however I decided to share what I had made, because I am not sure that it shows all that much. I think they look lovely and would never look for mistakes unless someone points them out to me! I think all of your snowflakes are beautiful! I love the way they look in hand-dyed thread! Snowy! They are all beautiful!!! Beautiful. No, we're not looking for mistakes!